Birthday is most special and awaiting the day of everyone’s life, coz this is the day when you born in this beautiful world to enjoy the best life with lots of happiness, emotions, some sadness, and some lessons. The best 2 days of everyone’s life is the day when they born and the day when they prove that why they born in this world. 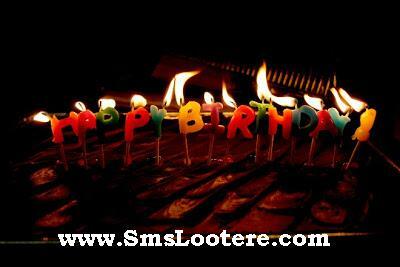 Here you may see the best try of Smslootere.com team to give the best collection of Birthday SMS in Hindi. Everyone is so excited to make their best day by celebrating the party with friends, family and loved ones with lots of ‘Masti’, Dance, cake cutting on birthday blast, and make your birthday really best, happy and special. Birthday becomes very special when all friends, family, and special one’s wishing you with different style like sending birthday SMS, messages, Greetings, Gifts. SMS and greeting are easiest way to wish them, sending your best wishes, love, and regards. 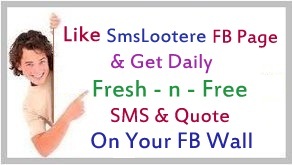 And now in an internet world, lots of sites have a huge collection of greetings and text messages in many categories like funny, sweet, romantic, best, quotes etc., and you can send it from the sites too. So wish your best one’s birthday in different and best style by sending greetings and SMS on strike of 12 and tell him that you remember them. ‘MANY MANY HAPPY RETURNS OF THE DAY’ ‘HAPPY BIRTHDAY’. Woh pal jald se le aye din bhar ke liye..
aur aap Muskuraye Dilo Jaan se. Itni khushiya de aapko ye naya aane wala kal!! Aapke pass hamesha wo insaan rahe. Jiss din aapko dharti pe bhej kar, khud ko akela paya hoga. Are kitna uchhal ke chal rahe ho. Par itna kyu fudak rahe ho..!! To khuda de sara aasma aapko. Is chaand si roshni mein teri surat hai samayi. To Khuda Roshni K Liye Humko Jalaye. Janamdin per mile jahan ki khushiyaa, bhale unme shaamill hum ho na ho..
Isiliye sabse pehle HAPPY BIRTHDAY kehte hai..
ekdum jhakkaass, JANAM DIN Tereko.. Check Kar lena Apne Mobile Ke Inbox Hardin.. SORRY 4 THE MISTAKE! KINDLY ADJUST PLZ..! 31536000 seconds meri Shubhkamnaye aapke sath rahe. Aur Kabhi udaas na ho Tera ye chehra jo hai bada hi Pyaara..
jab kabhi pukaroge aap Dil se, Maar bhi jaye to Jindgi se saanse udhar leke aayenge. Aur Apko janamdin ki bahut sari Mubarak Baad detey hain..
You were born with a gift, the gift of awesomeness! Hey, we are so blessed and thankful that the LORD has allowed seeing another birthday! God Bless You! Hey, Friend, Forget the last birthday you had; God saved the best for last! Full of wonderful surprises, His “suddenlies” are on the way to you now!